Tesla announced Monday that it plans to buy the battery maker Maxwell Technologies. Maxwell, based in San Diego, makes battery components including ultracapacitors and dry electrodes. Battery technology is key for Tesla as it ramps up production and expands its manufacturing presence into China. Tesla is buying Maxwell Technologies in a deal that values the battery-maker at $218 million, the two companies announced Monday. The deal will be an all-stock transaction that values each share of San Diego-based Maxwell at $4.75 - a 55% premium to Friday's closing price - according to a press release. With 45.0 shares outstanding, the proposed price values Maxwell at roughly $218 million. It's expected to be completed in the second-quarter of 2019. Maxwell makes ultra-capacitors, battery components that allow for fast charging and discharging of cells that they are connected to. It has also pioneered dry electrode technology, which it claims "has the potential to be a revolutionary technology within the battery industry." As Tesla ramps up vehicle production following its second consecutive profitable quarter and builds a new Gigafactory in Shanghai, China, those battery technologies could be key for its continued success. Battery chemistry and technology is by far the biggest obstacle for electric automakers to overcome. Maxwell has about 500 employees and was founded in 1965, according to its website. 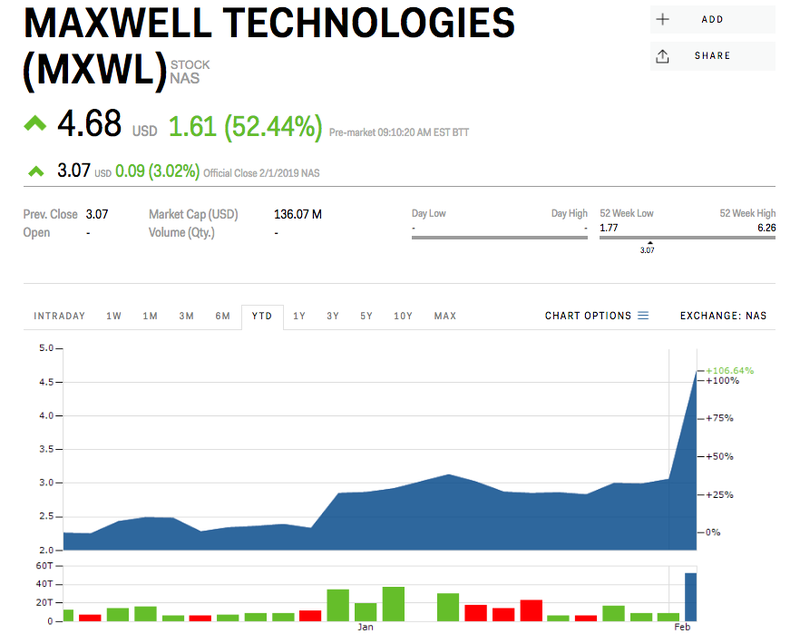 "We are very excited with today's announcement that Tesla has agreed to acquire Maxwell. Tesla is a well-respected and world-class innovator that shares a common goal of building a more sustainable future," Franz Fink, Maxwell's president and CEO said in the press release. "We believe this transaction is in the best interests of Maxwell stockholders and offers investors the opportunity to participate in Tesla's mission of accelerating the advent of sustainable transport and energy." Barclays advised Tesla's board of directors on the acquisition, it said in a regulatory filing with the Securities and Exchange Commission. Shares of Tesla rose about 0.3% in early trading Friday following the announcement of the acquisition. Maxwell, on the other hand, had surged about 52%, to $3.07. 9Porsche's factory in Germany manufactures over 160,000 vehicles per year. Take a look inside.